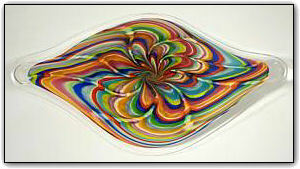 This wallbowl features many colors of the rainbow and was made from hand pulled cane. Making a cane wallbowl is a time consuming two-stage process. First Dirwood hand pulled the canes used to make this bowl, then he made the bowl using those canes. This wallbowl also has a 1" clear lipwrap around the perimeter adding extra elegance to an already elegant colorful work of art. Wall bowls can be hung on a wall just like a picture or they can also be set out as a table platter. To hang the bowl on a wall, all you need is a secure hook on the wall and a hanging apparatus comes along with the bowl. Hanging the bowl is a breeze and should take less than 10 minutes. You won't believe the compliments you are sure to receive when displaying this wonderfully colorful wall bowl!